Now, I know for a fact that this is not true, but was curious to find out how such a compelling claim can be made using real data. So I set out on a quest to reverse engineer the steps — from the normal way of calculating the proportion of active funds beating passive funds, and then adding constraints to ensure that this proportion moved to 95%. The article talks about how ETFs in the west beat active funds, and how this is “not true in India”. To start with, in Western markets, analysts compare the active manager’s performance to the benchmark to understand if he has managed to beat it. In India, the popular strategy seems to be to compare the performance of passive ETFs to that of active funds. In the West, the objective is clear — to see if an active manager produced alpha. Here too the objective seems to be getting clear — to show that ETFs fail to beat active funds, even though that is not the stated objective of any ETF, and therefore makes no sense. I too will stick to the Large Cap (LC) universe so that the numbers are comparable. For simplicity, I’ll restrict myself to the analysis of the 5 yr returns of active funds, to verify if they have beaten the benchmarks. Since I have considered 5 Yr returns using data as of 9th January instead of Sharad’s 30th November, the absolute returns won’t match, but the relative difference for 5 Yr returns shouldn’t be significantly better or worse. Within the LC category there are basically only 2 significant benchmarks — the Nifty 50 Index and the Nifty Next 50 Index. Together, these cover the entire LC universe. Anything else is either a repeat of the same, or not broad or scientific enough to be considered a benchmark. The Nifty BEES and the Nifty Junior BEES have been the two most liquid and trusted ETFs representing these benchmarks, and therefore we’ll stick to them for this analysis. Any reasonable passive investor would have split her money equally between these two funds, and slept peacefully for the next 5 years. Thus the average performance of a passive investor over the last 5 years would have been 16.84%. At this rate of return, only 6 out of the 44 active LC funds beat the passive investor. That is a mere 13.5%. SO HOW DO WE MOVE FROM 13.5% TO 95%? In order to claim that 95% of active funds outperform passive ones, the maths says that 42 out of 44 funds need to beat the passive ETF investor. However, at this point only 6 do. The aim is to now change the calculations so as to reduce the benchmark return to between 9.95% and 10.33%, such that only 2 funds will lose out to the benchmark. The first step is to always “fix” the benchmark. The traditional way has been to use price return benchmarks to get a 1.5%–2% instant boost, as dividends can be eliminated from the benchmark while being counted as active fund “performance”. However, this article does take care to not consider indices, but use ETFs and Index Funds instead, and that is well appreciated. The logical step to reduce the benchmark return would be to simply eliminate or under represent the Nifty Junior BEES. This fund considers the next 50 large cap stocks, and it is a fact that all LC funds invest beyond the Nifty 50 stocks and have significant holdings in the Nifty Junior. Because of this, it should be fair to include the Nifty Junior in the passive portfolio. 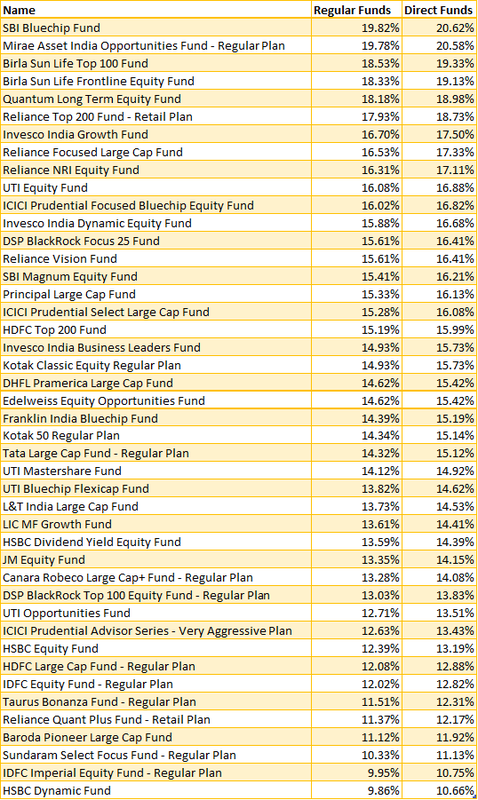 However, given the fact that the Nifty Junior BEES beat every LC fund, you can’t get to a 95% number with the fund in there. Let’s try reducing the Junior representation first. How do we do that? Assume that the passive investor actually goes out and buys ALL the ETFs out there. The Nifty Junior weight in her portfolio falls to 12.5% from 50%, and the average ETF return falls to 13.5%. It beats common sense to understand why someone would actually buy 4 different Nifty ETFs and 2 Sensex ETFs, while allocating equal money to each. Even if one were to buy all funds, they would see that there are 4 DISTINCT LC ETFs available, tracking 4 DISTINCT Indices — Nifty, Sensex, Nifty Junior and Nifty Shariah. At worst, the person would allocate 25% across the 4 distinct benchmarks, and then buy within that equally. But this assumption would be fatal for the analysis, as the average passive performance would fall to only 14.4%. 14.4% would mean that only 50% of the active funds actually beat the benchmark, leaving 45% more to cover. However, let’s now decide to invest in every ETF equally, leading to an average performance of 13.5%. Now the proportion moves to 70% — much closer to the 95% target. However, 70% is not satisfactory enough. So, how do we push it to 95%? Now comes the next idea. Reducing the weight of Nifty Junior works well, but at 12.5% the Nifty Junior weight is still too high. So we need to reduce it further. Let’s throw in Index Funds. 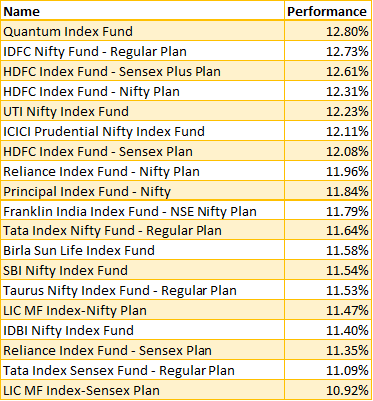 There are 19 index funds that track either Nifty or the Sensex. Anyone who has managed an ETF will tell you how Index Funds are highly inefficient and expensive, and should never be used for passive investing. This is also clearly evident from the fact that the average Nifty Index fund gave a return of 11.5%, while the average Nifty ETF produced 12.6%. However, adding 9 more funds (not sure how they were chosen) that track the same index as the Nifty BEES, but far less efficiently, will reduce the weight of the Nifty Junior BEES to below 6%. Good enough, so lets now make it 17 passive funds. Adding 9 Index funds randomly to the 8 ETFs we mentioned earlier, the average passive return can be reduced to about 12.4%. At 12.4% return for the benchmark, 80% of the active funds beat the benchmark. Things are now looking brighter. A little more and we’ll be close to the 95% target. Of course, never mind that direct MFs (<5% of MF AUM) don’t represent the portfolio of a real MF investor, and the fact that the burden of several shady Index funds has been added to ETFs to create the passive benchmark. Now 80% has moved to 86%. I still can’t get to 95%. With no other option left, I’ll just throw out the Nifty Junior BEES now. There is no way we can get to 95% with that in the benchmark. Now without the Junior BEES, the benchmark of the 17 passive funds falls to 11.9%. So these are the 5 simple steps to proving that 95% of active funds beat ETFs. Start with the 16.84% average returns for a reasonable passive investor benchmark. Add several more highly inefficient Index Funds (that by design perform poorly and are expensive) to the benchmark side to further reduce the passive returns. Return on the benchmark falls to 12.4%. 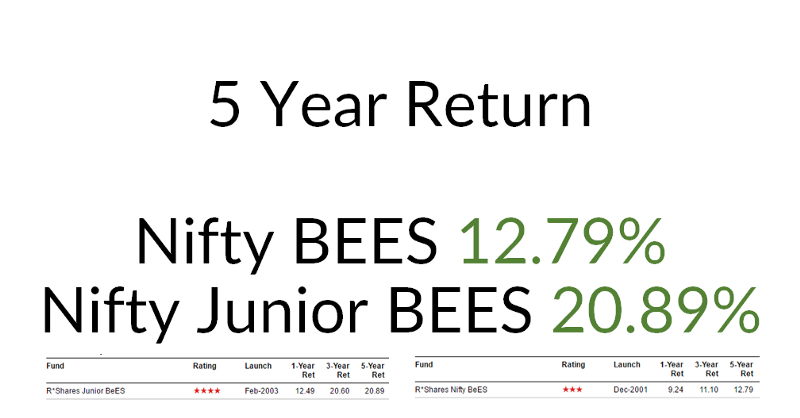 Remove the best performing ETF (Junior BEES) even though every LC MF holds stocks in the Nifty Junior index. Return on the benchmark falls to 11.9%. 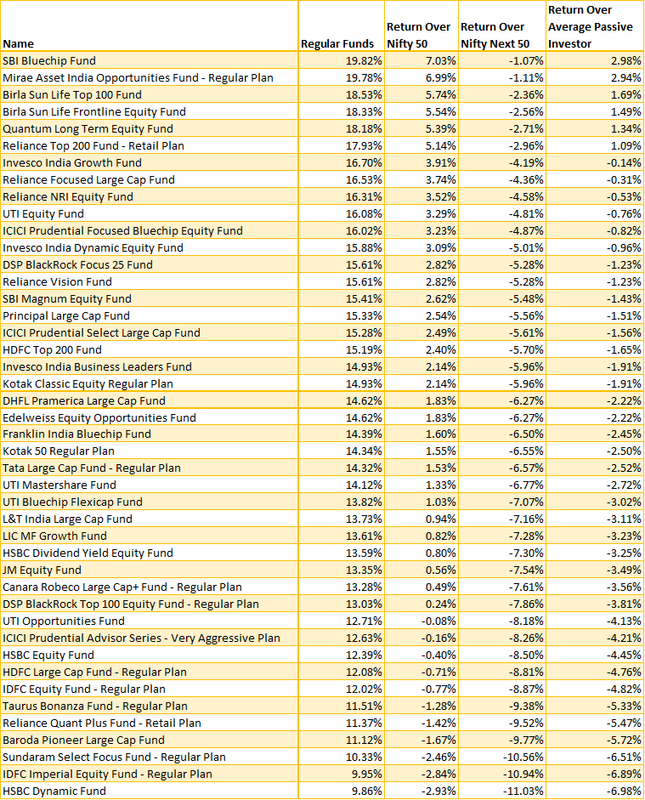 The point of this exercise is to show that, depending on what an “advisor” wants to push, using the same data with the right massaging, one can claim that 0% active funds beat the benchmark (using only the Junior BEES) or that 95% did (using Sharad’s adjustments and analysis). The truth really depends on what is in your portfolio, not what is on the market. You can’t change your investments retrospectively. Market returns are not your returns. Data can very easily be selected in such a way that any conclusion can be justified. Be it Sharad or I, we obviously want to promote our own products. You need to take everything a salesman says with a pinch of salt. The only way to figure out real performance is to put money on it.